It‘s one of the moments when you are sitting on the working desk in front of your computer and slightly loose attention thinking about how long it‘s been since your last real vacation. That‘s the moment when I knew it‘s time to finally go back to Capri. I was in for a slightly extraordinary weekend getaway after some regular weeks without having boarded any plane. So I hopped on a plane of our home-carrier, were totally buffed by their Austrian Holidays concept (hello free magazines, newspapers, wines and hot snacks for everyone) and boom were touching down in a somewhat cloudy Naples. I couldn't resist booking an aisle seat due to legroom, even tough the vistas of the volcano Vesuvio & Sorrento would have been stunning. Anyways, Naples airport is a cozy place and within 30 minutes I was finding myself on the ferry port of the city. While the hydrofoil took roughly 45 minutes, a regular ferry can take 1.5 hours. Once arrived in Capri, a hotel employee was already waiting for me, took care of the luggage and handed over a complimentary ticket for the funicular (I didn't believe it neither that something comes for free in Capri). Even the luggage transport went well and 30 minutes after check-in the luggage arrived en suite. Unfortunately at this point I have to mention the only point that was quite disappointing at Punta Tragara. I arrived at 10 pm and was just up to get to the room very quickly to refresh. There were two couples being checked-in before me and so I was waiting for minutes, waiting until a staff member arrived what seemed like a trainee. Of course she couldn't do the proper check-in so she said someone will arrive soon. I was getting upset to be honest and it was nearly 10.23 pm until a pretty lady arrived and took me over to the room. Everyone following this blog knows that the arrival is the most critical point for me at a hotel and once it is messed up, the entire stay was kind of bad (e.g. Ritz Carlton Vienna). 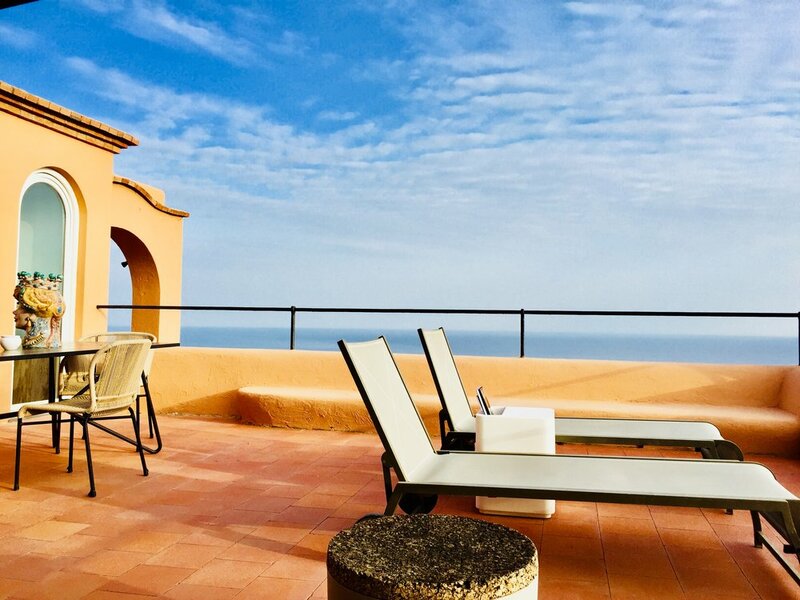 BUT, that‘s the moment when Punta Tragara turned out to be one of Italy‘s best properties. I opened the door and what I found was one of the hotel‘s top Signature Suites - Honestly at this point everything was forgotten and I was speechless - literally. A handwritten note, along a fruit basket and the typical cake were waiting too, so the arrival process turned out very well. The double bed was just prettiness overload with three pillows per person and it did not just look great - I had an amazing sleep both nights. Obviously there bathroom wasn't less spectacular with toilet, bidet, single vanity, walk-in shower with window overlooking the sea and the island pus full size Etro toiletries (!) - who alone would have been worth 100 euros. Below the sink was a chic leather box full of bath amenities with the hotel logo on it. I always register the quality of a hotel by the little details. This time the hotel offered dental kits with Marvis paste in travel size plus a travel size mouthwash. Further amenities included two different pair of slippers for each guest, a top notch hairdryer along with plenty of other products. Ever dreamed of the most beautiful shower views? Well, from my point of view you have to look no further. Next to the bed, the suite had a chic armchair, small television (at first I was disappointed by the size but I realized that once in Capri, the best movie is played on La Piazetta anyways where you should have a seat, order a Bellini and do observe Capri‘s enormously bustling nightlife), a writing desk along a huge walk-in wardrobe. Even tough we have seen bigger wardrobes (Raffles Istanbul standards), this one was the largest in comparison to the suite size. Space is a problem on a small and enormously pretty island like Capri: you have to maintain the character and can‘t expand into the sky. After I found out the rack rate of the suite, this massive wardrobe immediately made sense - think how small this wardrobe will become if the regular guest of this suite comes back in summer (Austrians will know their ex finance minister along his pretty wife well known due to the dazzling family name). Back from wardrobes worth more than a sports car to the most amazing feature. Remember that moment when you were sitting in the office starting to daydream about the sea? Well know we open the curtains after a heavenly sleep and walk onto the terrace. 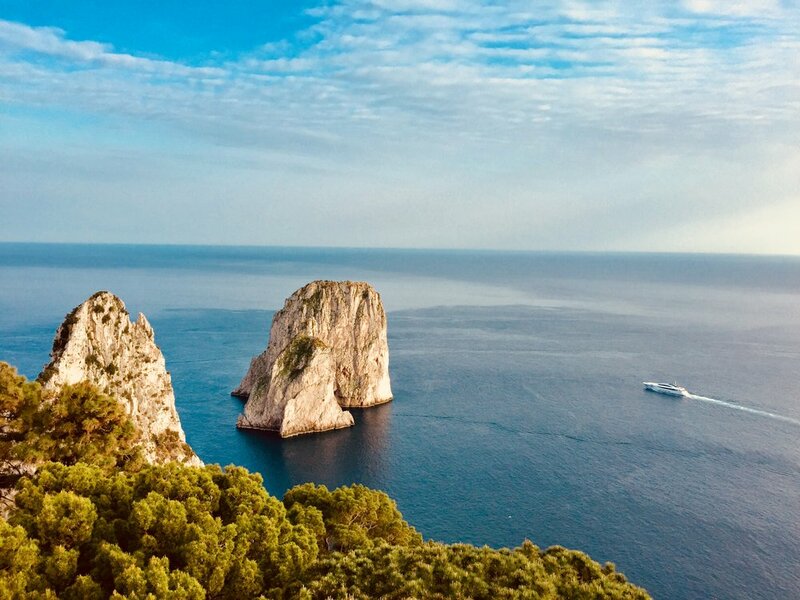 A slight salty breeze pushes into the face, the scent of pine trees and the sea get into your nose and your eyes focus on the birds chasing the Faraglioni - Capri‘s most celebrated stones ranging out of the Mediterranean. It‘s a feeling that can‘t be described any other than - Breathtaking! We are born to escape life not life to escape us, so grab a bottle of Franciacorta (Italy‘s version of Champagne), have a seat in the super comfy sofa on the vast terrace of Suite No 30 and just sit there to glimpse the blue sky going over into the turquoise of the Mediterranean Sea. Never will you have thought that the Mediterranean can be as pretty as the Indian Ocean. Well, Capri is the place to be speechless by the beauty of Europe. 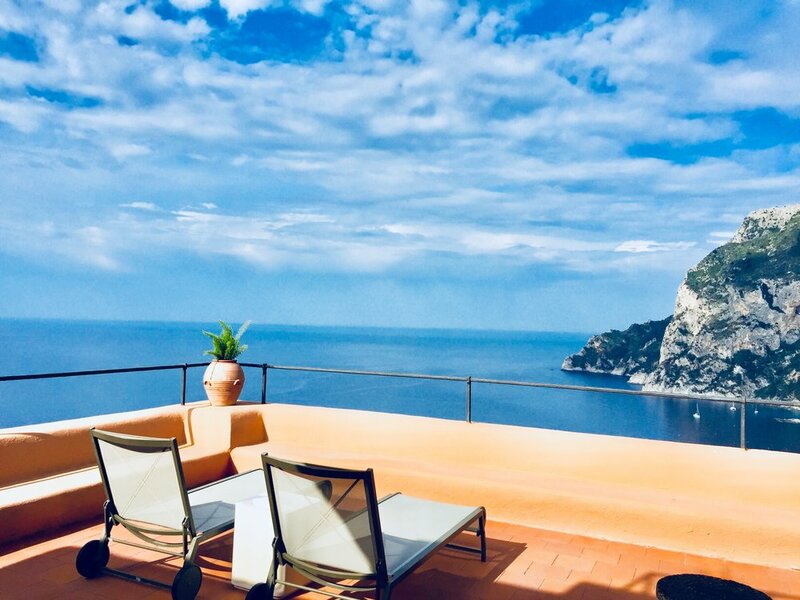 If we are all set and the first wow effects are over, it‘s time to order some breakfast in room in order to make use of the vast dining table on the terrace - of course we are overlooking Capri town and the sea at the same moment. A breeze comes again and you feel to dip into the outdoor pool of the Punta Tragara at the end of April... well Summer season starts early down here so don‘t hesitate due to the temperatures. Actually April and May is as perfect as late September and October are with warm temperatures, lots of sun and heated outdoor pools giving you the feeling of having your well deserved summer holiday already. Lying at the pool, you don‘t register the hotel bill growing into the sky. A San Pellegrino comes up to 10 euros whereas the sun screen may cost you 60 euros or more. 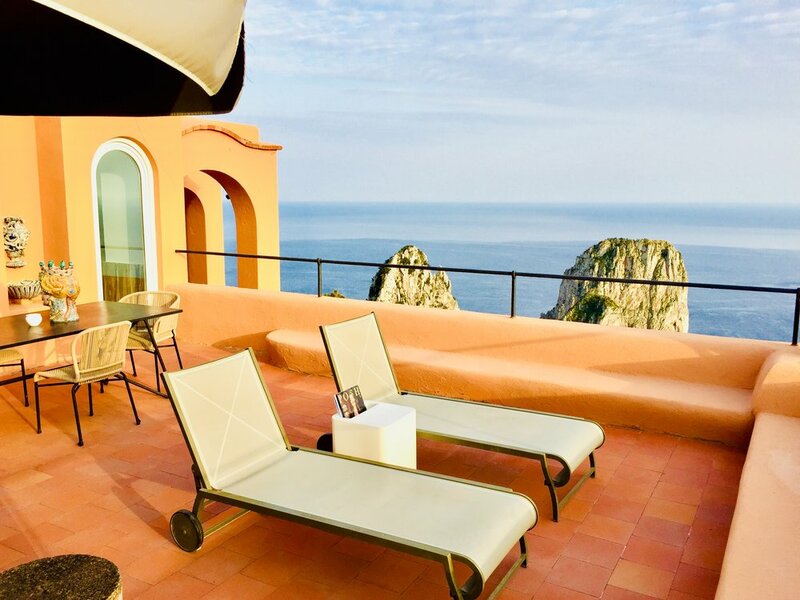 Did we mention that Capri is enormously pricey? However this should not stop you from going there as it is one of the most amazing places in the entire world and you have little options when staying here in terms of shopping and dining. Dinner in town can set you back 40 to 300 euros - per person obviously, the ferry 24. If you want to go for the extra feeling, grab a taxi and enjoy a ride in a convertible. 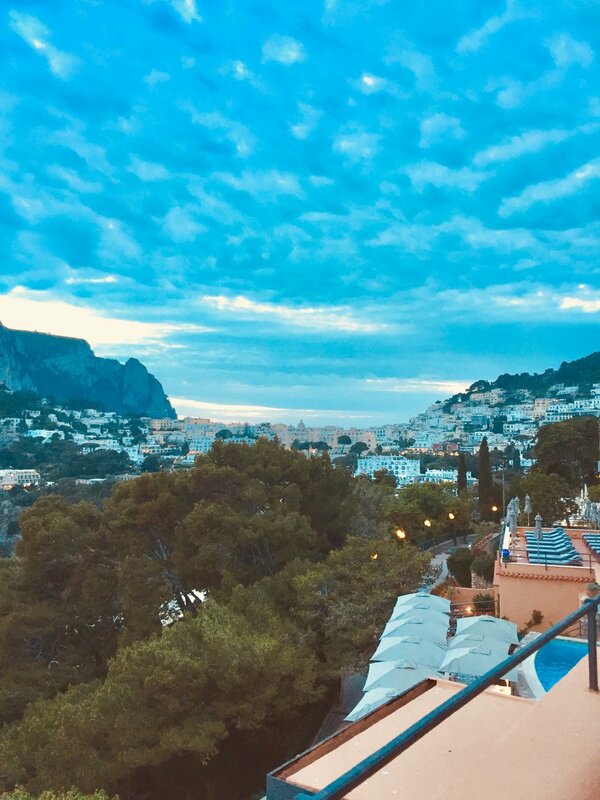 Since I didn't leave the hotel but once, I cannot rate the general quality of the food&beverage level in Capri however had the chance to try Mamma Restaurant (more here). The first evening I was having dinner at the Punta Tragara‘s stunning restaurant that should be rewarded with a Michelin star. For an Aperitivo, I would strongly recommend La Piazzetta - remember that the cafè is cheaper at the bar than on the terrace, but also a lot less spectacular - you decide! Obviously I had a perfect sleep and was extremely hesitant because I couldn’t decide whether to have breakfast in the restaurant or at the terrace. If I would have had two full mornings, it would have been both, however with my early departure I went for the buffet downstairs. Service was partly good (opposite for dinner when it was constantly amazing) with dirty plates being left on the table and not bringing new cutlery or refilling orange juice plus I missed that they didn't ask for any egg selection. There wasn't even a menu handed over for the egg selection. Anyways the buffet was lavish and there were plenty of options such as best Mozzarella and tomatoes, amazing salmon, tasty bread and plenty of sweet dishes. 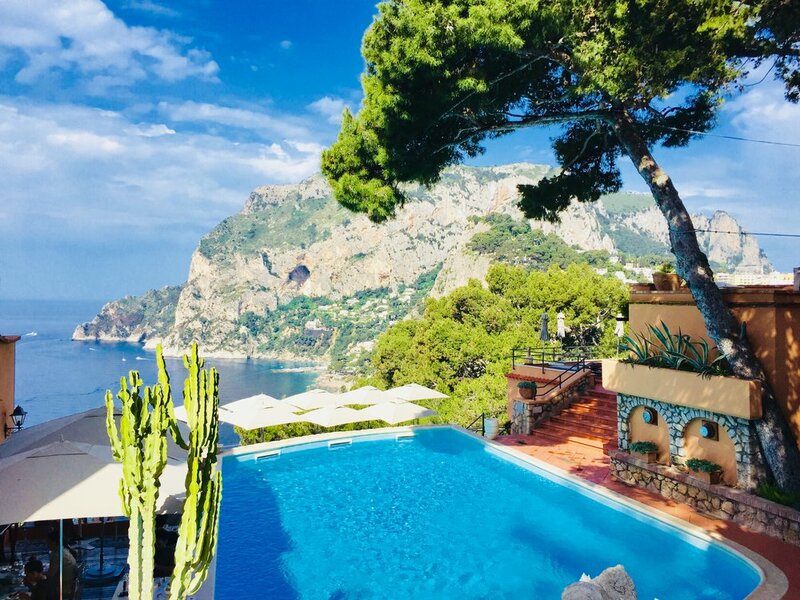 The fruit selection was impressive, too - however at the steep rates of 900 euros in low season, I expect to be served my Eggs Benedict without asking for it - in order to fully enjoy this breathtaking vistas of the sea and the island. During my stay there was also a celebrity couple staying in house (probably more but I didn't register them) and you could see how they were discreetly offered the best table in the breakfast room. At least it‘s Capri and who can‘t deny a holiday there? I can warmly recommend a walk through Capri in the evening and do a little bit of shopping pre-dinner. There should always be time for a Spritz on the main square. After a dinner at the Michelin-starred Mamma Restaurant, I fell into the bed and was not at all ready to get up at 5 am in order to catch my boat to Napoli at 6 am. Unfortunately I was not offered a breakfast box even tough the staff knew about my early departure. Sometimes there are opportunities to impress a guest from different points, my happy moment was the amazing suite upgrade and I am very grateful for that stunning accommodation. Considering the high price for a stay at Punta Tragara, I am rating this stunningly situated hotel with 8 out of 10 points. We were exclusively hosted by Punta Tragara Hotel & Manfredi Collection. All above written expresses our own opinion and has not been influenced.